Surplus used, serviceable condition: Fair to Good. Will show use and wear to all parts. Some parts seem to have been painted at one point over their faded original finish: Upper, Charging handle, Delta ring. Ejection port door generally will have some discoloration. 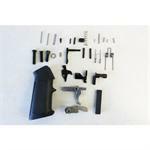 Kit does NOT include lower receiver, barrel, or auto sear. Items included listed below. All parts kits are sold for replacement purposes only. We cannot ship all parts to California, New Jersey, Washington, or anywhere else prohibited by law. We have added an option to have restricted parts removed from kit to allow for shipping to restricted states/areas. Photos are for general reference only; condition/color of the pieces/parts/furniture vary kit to kit. Price listed is for one kit.